A Democratic Iowa county chair called Sen. Elizabeth Warren (D., Mass.) "very shrill" in a new report as the presidential hopeful descends on the critical caucus state for the weekend. Jim Eliason, the chair of the Buena Vista County Democrats in northwestern Iowa, told U.S. News and World Report that her tone on President Donald Trump and in general was "very shrill," a term often decried as sexist against outspoken female candidates. "She's very shrill. I think that's going to put some people off. But I think that, you know, she says a lot of things that need to be said," Eliason said. "The tone she's been talking about Trump is very shrill. I think that kind of rhetoric needs to be used very, very sparingly." "If I were Elizabeth Warren I would be thinking about, how can I speak to rural voters in the Midwest in Trump country? Every Democratic candidate for president has got to tell themselves Iowa is winnable, but we can't do it the way Clinton did it." Warren has been one of Trump's most outspoken critics, and Trump in turn has long derided her claims of Native American heritage by calling her "Pocahontas." Warren fundraised this week off a Politico story that was panned by progressives for wondering if she could overcome being "written off as too unlikable." Her campaign called it "gendered nonsense." She also tweeted a video of herself in the quiet car on an Amtrak Acela train, writing, "I hear women candidates are most likable in the quiet car." Eliason's proposed attempt at humor with Warren might not go over well. He noted the county bordering his to the east is Pocahontas County and said he is considering bringing it up to Warren to get a laugh. "I think I'm going to mention just in passing—to try to generate a laugh, if I can—that the county seat of the county just east of here, the county seat is named Pocahontas," he said. "Just as a joke." 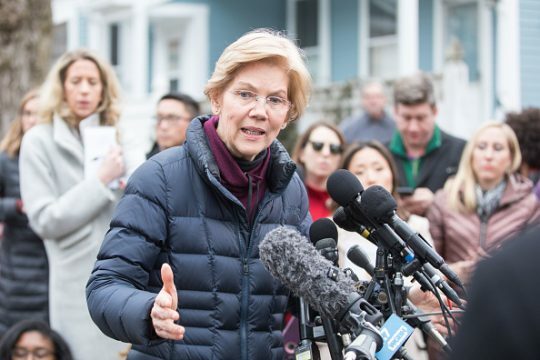 Warren is holding a series of events in Iowa over the weekend following the formation of her presidential exploratory committee, and she's made several high-profile hires for her team in the critical caucus state. Her visit will include stops in Council Bluffs, Sioux City, Storm Lake, and Des Moines, as she tries to carve out an early position of strength in what should be a crowded Democratic 2020 field. This entry was posted in Politics and tagged Donald Trump, Elizabeth Warren, Politico. Bookmark the permalink.